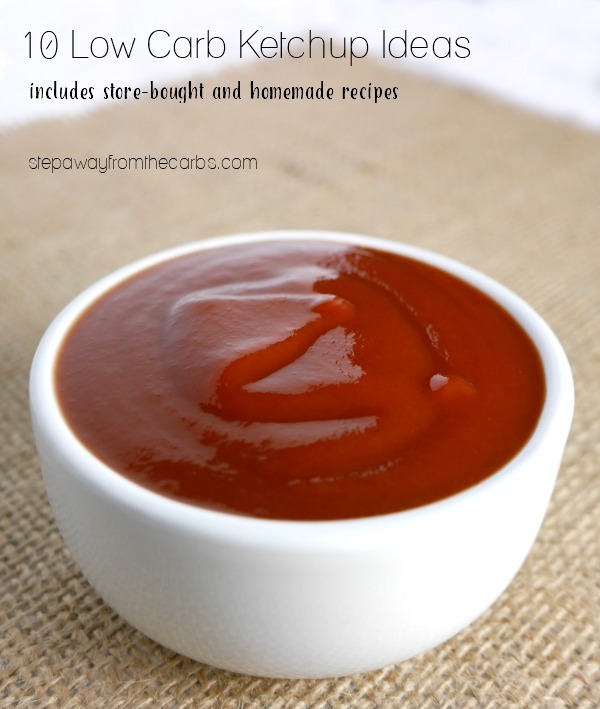 Looking for some low carb ketchup? Here are 10 ideas for you to try – including both store-bought and homemade options! 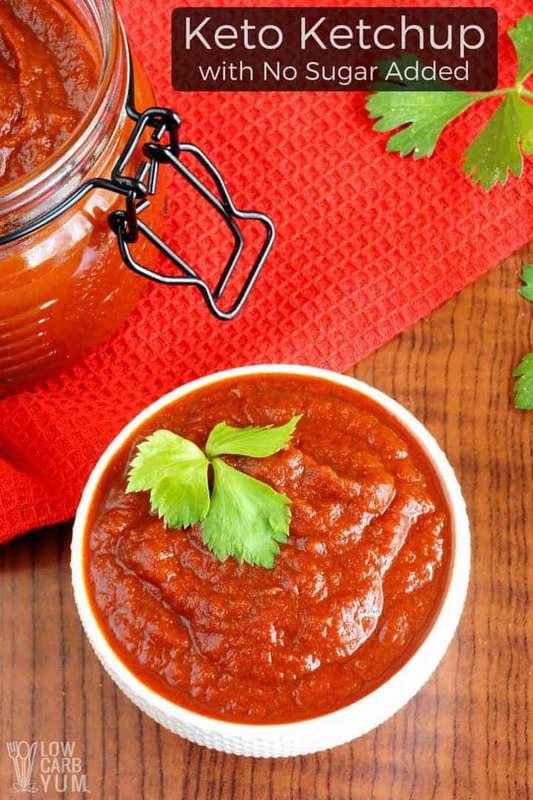 So why do we need low carb ketchup? Well, for starters most ketchups aren’t sugar free. 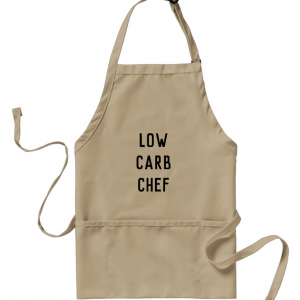 And regular versions usually have a carb count of 4-5g net per tablespoon. 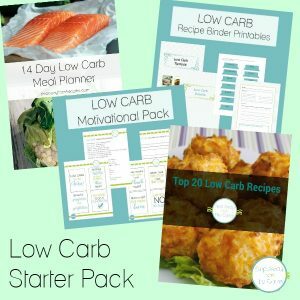 That adds up fast – and if you’re following the kind of low carb diet where you keep the carbs to under 20g per day – it rules it out completely. First up is the G Hughes Ketchup. I originally tried this sauce when I made my bacon-stuffed burgers (which are delicious, by the way). You can buy it from Netrition or Amazon, and it’s sugar free, has great flavor, and only 1g net carb per tablespoon. It’s also really thick with just the right amount of a sweetness – although the sweetener they use is sucralose, which may not work for everyone. Next is the Nature’s Hollow Ketchup. You can buy it from Amazon or Netrition, and it’s sweetened with xylitol. But the carb count is the highest of the lot – at 4g net carbs per tablespoon, which is pretty close to a regular ketchup (although, of course, it is still sugar free). The taste was fine – just slightly lacking in something. Nothing special. 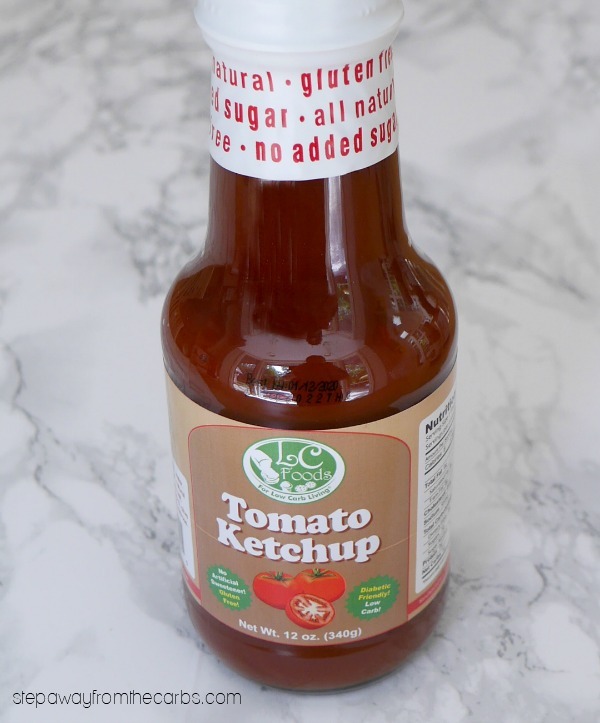 The next low carb ketchup that I tried is the own brand from LC Foods. You can get it from their own site, as well as Amazon or Netrition. It’s sweetened with a mixture of stevia and erythritol, and was the only one out of the four that wasn’t completely smooth in texture. It was still good though, although it was slightly more vinegary than the others. 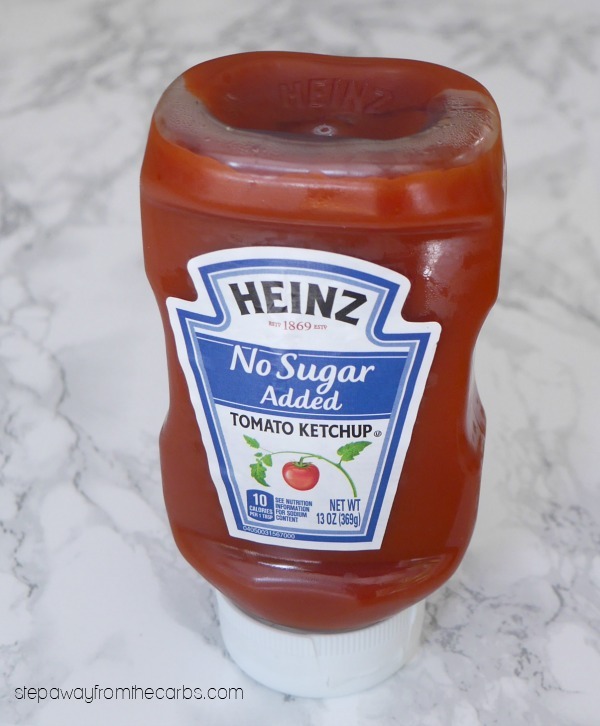 And finally – the Reduced Sugar Ketchup from Heinz. As well as being able to buy this from Netrition and Amazon – this ketchup is actually available in supermarkets, too! 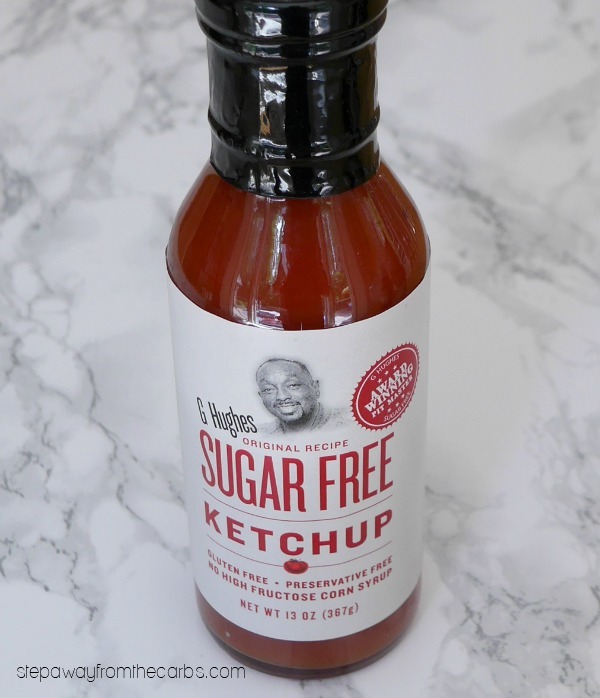 It contains 1g net carb per tablespoon, and like the G Hughes ketchup is sweetened with sucralose. 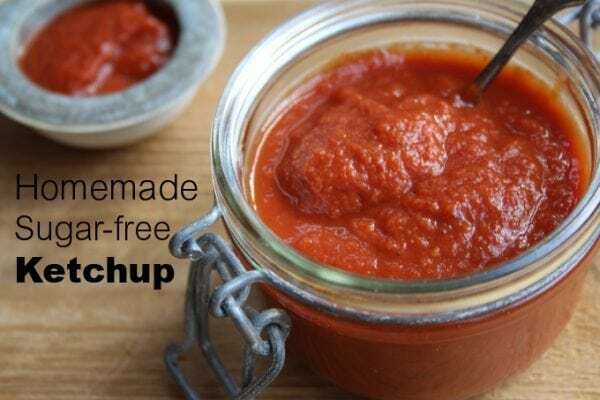 This is actually the standard ketchup in our home that my son and husband enjoy. They are perfectly happy with the taste and don’t miss the sugar. I think it’s a very good product! In conclusion, I rate the ketchups from G Hughes and Heinz very highly. 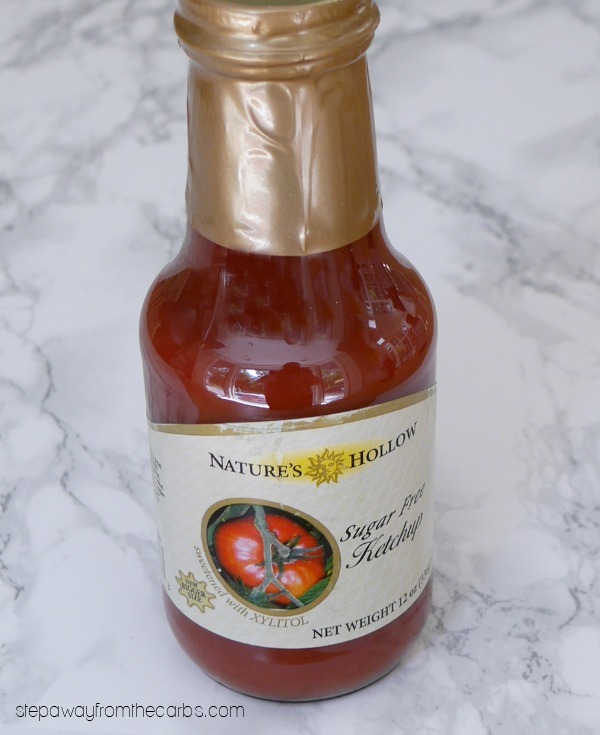 The LC Foods ketchup is fine, and Nature’s Hollow is more geared towards the sugar free market rather than the low carbers. Note: I want to give a quick “shout-out” to Walden Farms ketchup – it was out of stock when I tried to order it for this post. 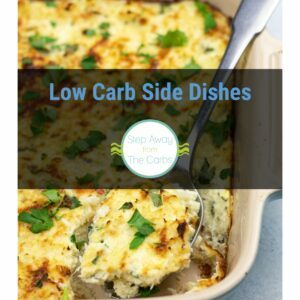 But I’ve tried it before and although it’s not as thick as the ones I’ve tested in this review, the taste is fine and it is ZERO carbs! It’s available from Amazon and is sweetened with sucralose. 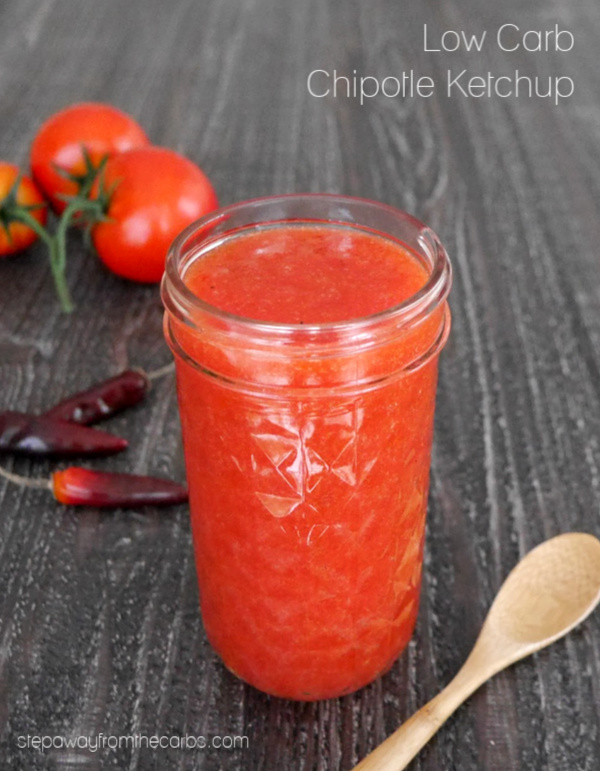 Want to make your own low carb ketchup? 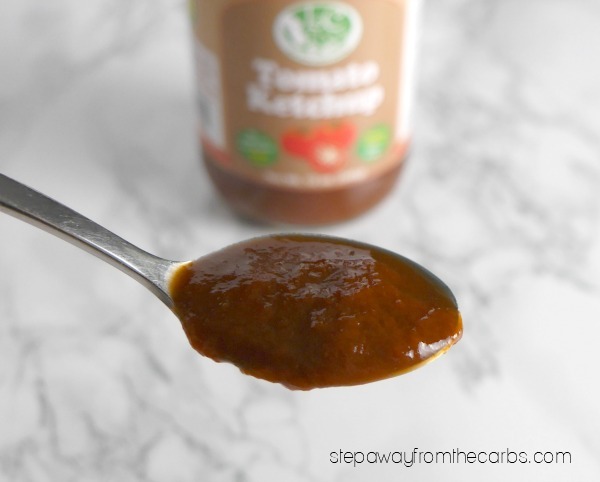 Low Carb Ketchup from That’s Low Carb?! 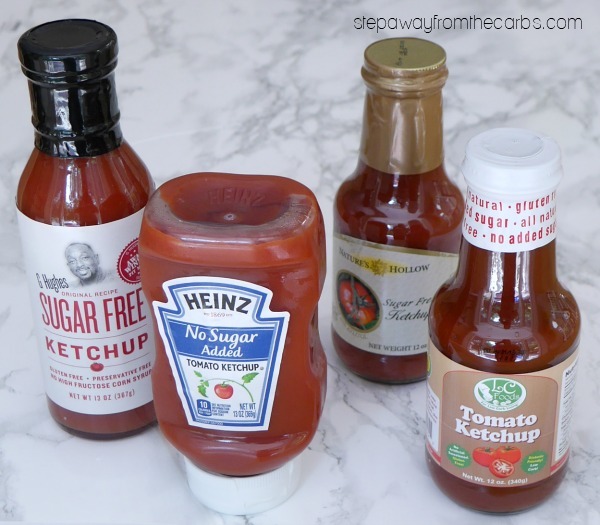 Have you got a favorite low carb ketchup that I’ve not mentioned? Let me know! Thanks! Are you on mobile, tablet, or computer?